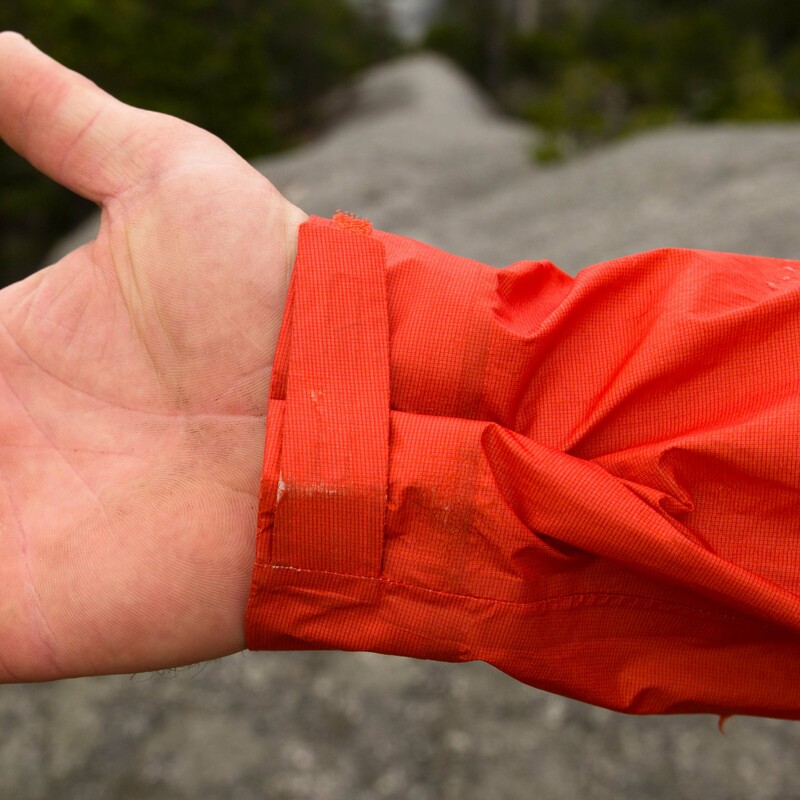 If you’re like me you take a waterproof jacket on most summer alpine missions, just in case. In case there’s a rain shower or a snow flurry, strong winds or (hopefully not!) an unplanned bivi. So, if the jacket is going to spend the majority of the time in my pack I don’t want to take something bulky or heavy. So instead of the eVent or Gor-tex jacket that I’d use when planning to be out in poor weather, this just-in-case jacket is light and packable. This has typically meant that the jacket is made with a coated fabric instead of a membrane based fabric which of course limits the long term performance and lifespan. 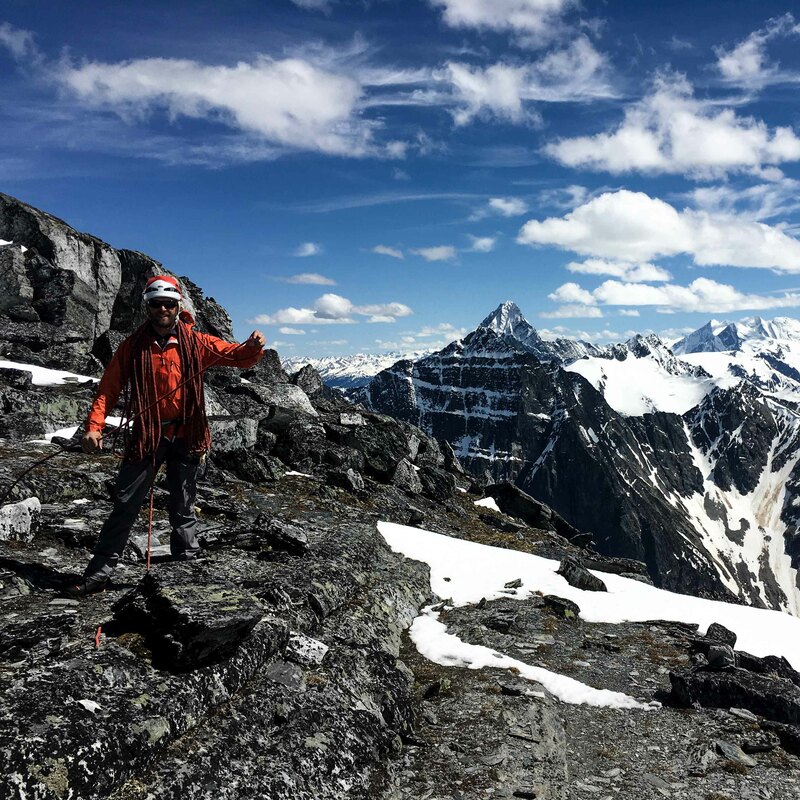 However, RAB has recently come out with an updated Flashpoint jacket which is exceptionally light and packable but still constructed of a 3-layer membrane fabric… so how did it perform? Very well actually, not surprising though as it’s made by RAB! But of course there are always some trade-offs. Using the Flashpoint to cut the wind on a cool day in the alpine. Before we dive into the review lets briefly discuss the fabric that’s used to construct the Flashpoint. Pertex Shield® Plus comes in 2.5 and 3-layer options, the Flashpoint is constructed with the 3-layer fabric which is a bit more durable and breathable. 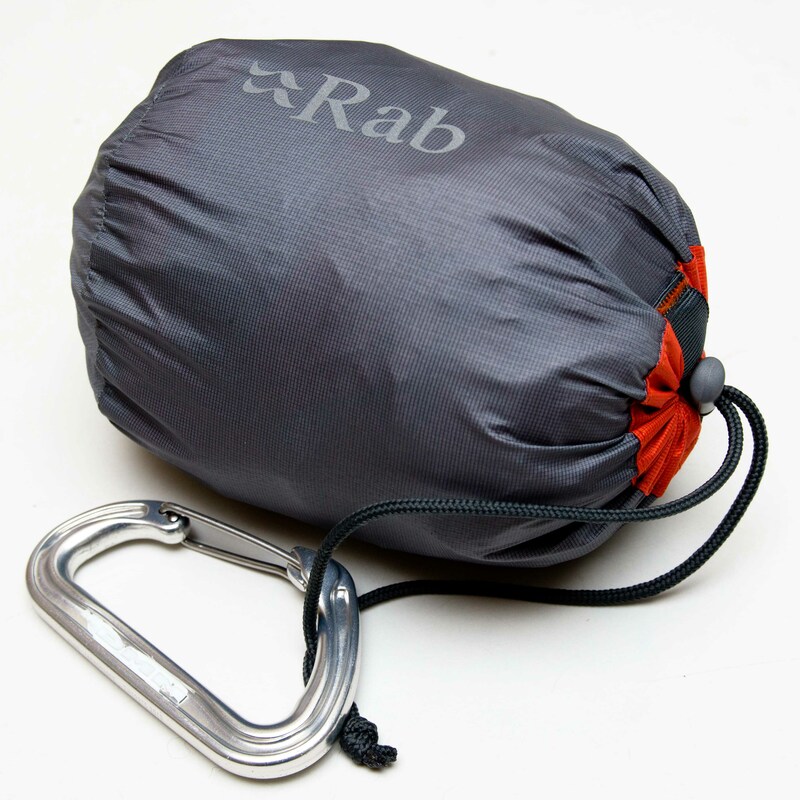 The fabric is lightweight, very water resistant, breathable and extremely packable. The down side is that it’s not as robust or abrasion resistant as other 3-layer membrane based fabrics. Basically this material is the weight of a coated fabric but has many of the benefits of a 3-layer membrane fabric. The hood on the Flashpoint fits well either with or without a helmet. Here I’m wearing a Meteor helmet and still have great peripheral vision and freedom of movement. The Flashpoint is sized to fit over a thin layer or two but nothing very bulky. It doesn’t stretch at all, not surprising for a hardshell, but the cut still allows for a great range of movement when climbing and so I never felt restricted. The hood fits great with or without a helmet thanks to the adjustment cords at the back of the head and along the brim. The sleeves are fairly long for the size of the jacket, great for all you tall guys out there, but are easy to adjust with the velco cuffs and don’t ride up when reaching. Basically the Flashpoint doesn’t wear like a typical restrictive hardshell, the light fabric combined with the climbing friendly cut allow you to forget it’s even there. The Flashpoint in it’s stuffsac with a DMM Chimera carabiner for scale. This jacket packs down into a tiny package! Simple but functional is what comes to mind when thinking about the features on the Flashpoint. It has a single chest pocket that is appropriately sized. The zipper is waterproof as are all the seams. There are no pit-zips or other vents which are not needed on such a light jacket. The cuffs have a thin velcro adjustment system that works well while keeping the weight down. The hood is adjustable and fits well both with and without a helmet. Simple, functional and well thought out. Velcro cuff on the Flashpoint. Also note the wear on the cuff, this material may not be as delicate as a coated fabric but still isn’t as burly as a pro shell either. Simple, extremely packable and lightweight the Flashpoint is hardly noticeable in my pack, perfect! It’s also surprisingly breathable and very waterproof. Even in sustained rain events the Flashpoint has kept me as dry as any of my hard-shells. Better than some actually as the thin and lightweight fabric isn’t nearly as hot and so I don’t sweat as much. However, the trade-off is in the durability. After a few times alpine rock climbing in marginal weather there is some wear on the cuffs. Not that a bit of wear on the cuffs is a big deal, it just shows that the fabric has its limitations. At the end of the day it’s light enough be to be a just-in-case jacket but performs like a all-day bad weather jacket. Overall: It weighs nothing, packs into a bag the size of a standard beer can and performs amazingly well in adverse weather. 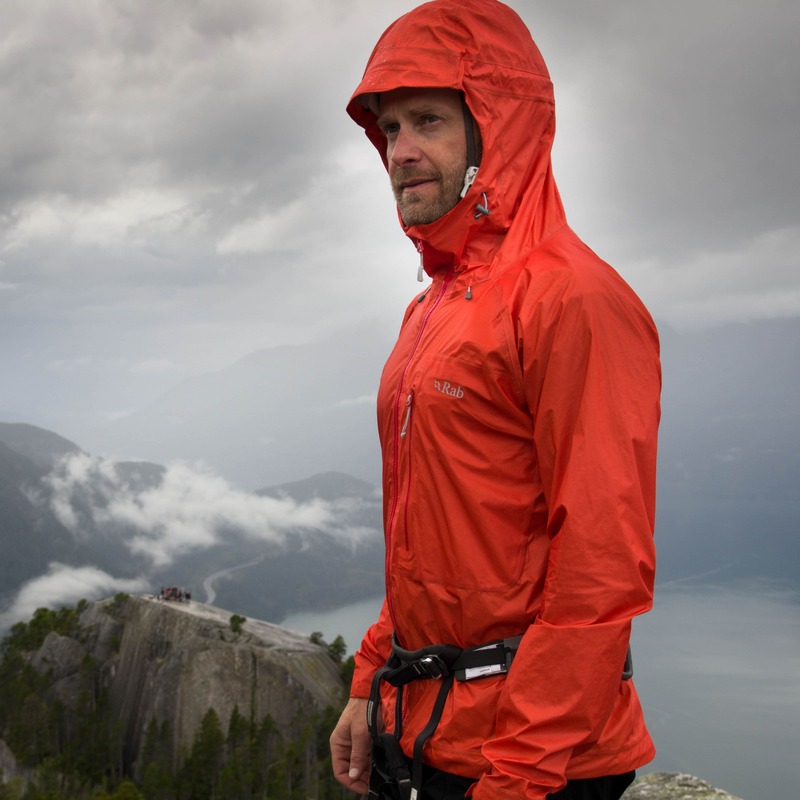 Simply a fantastic lightweight shell for hiking, climbing, mountaineering, etc. A sample of the jacket was provided for testing but this in no way influenced our review. Product shots provided by Bonsta.ca.